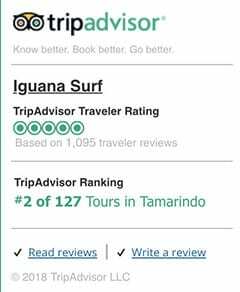 guana Surf Shop was established in 1989 in Tamarindo, Costa Rica. The shop quickly moved into a once famous location in Tamarindo known as the Iguana Surf Rancho, a beautiful 4-story rancho with all natural woods and native carvings. In March of 2009, a brush fire in the back of Tamarindo ignited the rancho and the whole building was lost along with a local restaurant, Kahiki, and two shops. 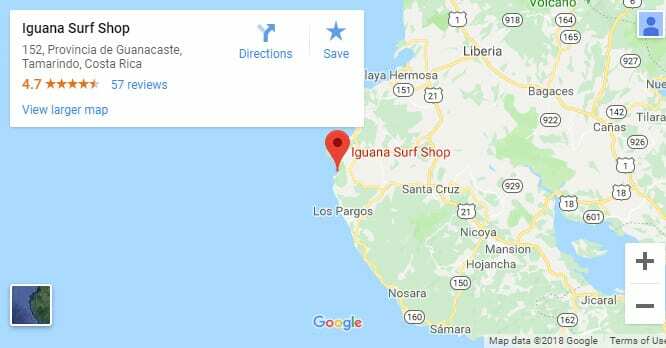 Iguana Surf was survived by two sister locations. One spot was located in the largest all-inclusive hotel in town, The Barcelo Hotel (now the Occidental Hotel) in Langosta. The other location was on the beach in Tamarindo in front of the most popular surf spot in town. 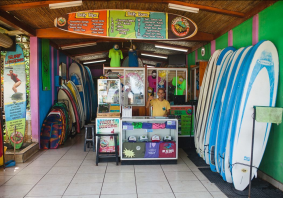 The sole remaining location in Tamarindo offers surf camps, surf lessons, rentals, tours, merchandise, and tourist information. We have been serving the Tamarindo area since 1989. Our professional staff will help you find the tours and rentals you are looking for. 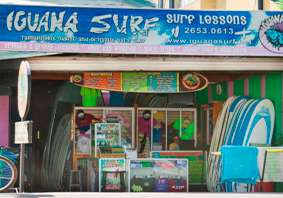 With 3 surf lessons a day and over 125 surfboards to rent, Iguana Surf Shop is your one-stop-shop for learning to surf. We operate or sell over 30 tours in and around Tamarindo Bay. Please look through our webpage or email us with any question you have.